Improve your control efforts with these helpful tips. Do look for water problems. Whether it’s a pinhole leak or something major, water can often lead to ant or other pest issues. — Brett Lieberman, Owner, My Pest Pros, Fairfax, Va.
Do conduct a thorough inspection of the property inside and outside. I walk around the outside and identify problems, such as bushes that brush up against or touch the structure, standing water, clogged gutters, and trees touching the roofline. Anywhere ants can get in from the outside, they will. Inspect inside, especially around and under cabinets, and under the sink where the pipe enters the ground. — David McMillian, Owner, Pest Arrest, Greer, S.C.
Do reduce entry points. If there are problems that need to be taken care of, I need to put that ball in my customer’s court — or charge them a fee to take it on myself. Fortunately, I am capable of doing most of the things I recommend. Handyman-type work is something I’ll even take time out to do on the weekends, especially for my older clients. — Scott Campbell, President, Abode Pest Solutions, Sanford, Fla.
Do take care of ants inside and out, not one or the other. On the outside of a house, treat where the ants are going into the home. On the inside, treat right at the location where you see them entering. Then those pesky ants won’t have too far to go to get their food. — Linda Short, The Bug Lady. Owner, Ballwin, Mo. Do identify the ants properly. Different species of ants respond to treatments differently. If you don’t know your species of ants, your treatment can make the matter worse, so treat accordingly. — Randy Darrah, Pest Control Technical Trainer, Slug-A-Bug, Melbourne, Fla.
Do sell with the intent to follow through. It is too easy to make a quick sale for an initial treatment, and not consider the total commitment necessary to achieve a meaningful outcome. Make sure you plan for any future visits to make adjustments,apply additional treatments and ensure the recommendations you made have been followed. — Keith Olesh, General Manager, Assertive Pest Management, Riverside, Calif.
Do figure out what type of food is attracting the ants. Is it protein or sugar? Look for pet food or food that might have spilled under the stove. — Brett Lieberman, Owner, My Pest Pros, Fairfax, Va.
Do inquire about the neighbors if you’re servicing a multi-unit townhouse, condo or apartment. The ant problem could be coming from a neighbor who might be struggling with the same problem. — Brett Lieberman, Owner, My Pest Pros, Fairfax, Va.
Do get in crawlspaces. We deal a lot with odorous house ants (OHA), at least in the Midwest, and that’s the No. 1 place they go. We find them hiding behind insulation, in the voids of the cinder block—or other areas you would never see. Sometimes you have to put on your detective hat. — Doug Foster, President, Burt’s Termite & Pest Control Inc., Columbus, Ind. Do identify the species. There are thousands of ant species, so you have to make sure you identify which ant you’re dealing with because each ant has a different habit, nest types. — David McMillian, Owner, Pest Arrest, Greer, S.C.
Do try to find out where the ants are coming into the house; once we do that, there are fewer callbacks. 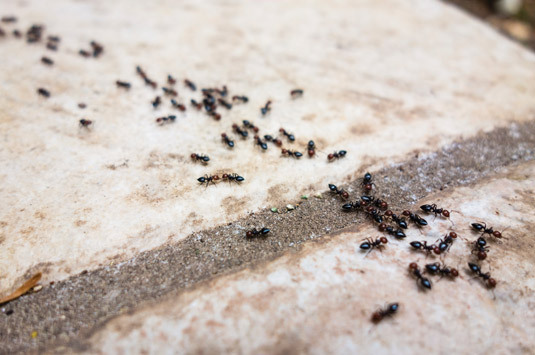 Usually, ants are coming into the kitchen or bathroom under the siding, through a hole in the mortar, or in a crack in the caulk around the window. — Linda Short, The Bug Lady. Owner, Ballwin, Mo. Do know which ant species you are dealing with. Although the average person just refers to these pests as “ants,” you might come across many species in your daily efforts. Each species has different characteristics for nesting behavior, food preferences and demeanor. It is important to know these factors when implementing an effective treatment protocol. — Keith Olesh, General Manager, Assertive Pest Management, Riverside, Calif.
freak out when they see ants three or four days later. If you don’t, you will get a call from the customer the next day saying, “You were just here yesterday and I’ve still got ants.” Set expectations with the products you use. — Randy Darrah, Pest Control Technical Trainer, Slug-A-Bug, Melbourne, Fla.
You can reach Diane Sofranec at dsofranec@northcoastmedia.net or 216-706-3793.